Come to Hilton Head Island with family and friends! Floating silver week! Buyer may receive a title fee credit, inquire for details!! *Marriott's SurfWatch* is a gorgeous property located on the popular shores of Hilton Head Island. 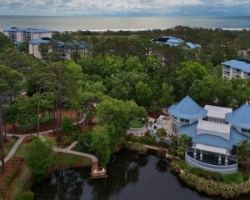 This new resort is a masterpiece of seaside style along South Carolina's east coast! Capturing the essence of the surrounding nature, scenic footbridges lead you throughout the resort to a spectacular oceanfront pool and a private beach along the Atlantic. A deluxe multi-head shower in the master bath, full kitchen, washer and dryer, and balcony are among the wonderful amenities in your villa. To discover more, visit www.marriottvacationclub.com. *Interval International Elite Resort* Featuring a finely appointed 3 bedroom, 3 bath suite, that will accommodate 12 guests comfortably. Usage is annual in a floating, silver season week. Maintenance fees paid annually. For more information or to make an offer, please submit the inquiry form.